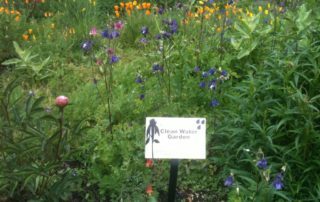 The Clean Water Gardens program was developed to help residents improve water quality and wildlife habitat in their landscapes. 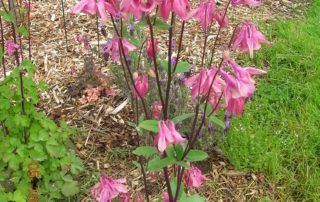 Residents who participate in the program by planting a naturescape or installing a rain garden receive a recognition package that includes a metal “Clean Water Garden” sign with a 24″ stake, a native plant, and two pairs of gardening gloves. 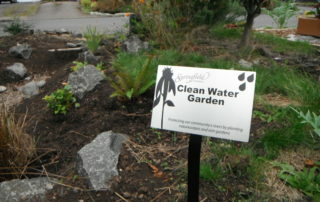 If you install a rain garden or naturescape on your property, email us at WaterResources@springfield-or.gov or call us at 541.726.3694 to receive your recognition package! “How to” guides are available at Springfield City Hall or at local nurseries. If you would like additional information, or to have the guides mailed to you, please call 541.726.3694. You can also view our Rain Garden Demonstration Site at 10th and “G” streets next to the Brattain House. Spring 2019: Take a short 9-question survey, and you’ll be entered into a drawing for $50 to a local garden center! We’re seeking your feedback on how to improve the Homeowner’s Guide gardener series, linked below. Thanks for participating!